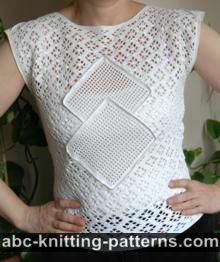 Materials: Aunt Lydia's 100% Mercerized Cotton, Size 10, 1000 yd/914 m white - 2 balls. Aunt Lydia's 100% Mercerized Cotton, Size 10, 350yd/320m blue - 1 ball. Work ch 3 at the beginning of each row, which counts as 1 dc. 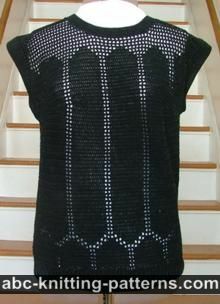 Top crocheted as one piece starting from the bottom of the back and finishing on the bottom of the front (see drawing). Row 1:1 dc in the 4th ch, 3 dc, 1 ch, skip 1, *7 dc, 1 ch, skip 1, 7 dc, 1 ch, skip 1,*, repeat from * to * 10 times, 7 dc, 1 ch, skip 1, 4 dc. Rows 2-105: 13 pattern repeats, 8 rows each. Rows 106-129:To shape a neckline skip 4.5 horizontal pattern repeats (72 sts) in the middle of the back and continue to crochet both sides separately for 24 rows (3 vertical pattern repeats) . Chain 72 to connect the sides. Rows 130-225: Continue Filet pattern for 12 more repeats. Row 226: as row 1. Tie off. Join side seams leaving 8" (20 cm) open for the armholes. 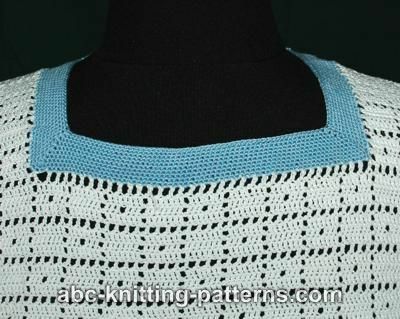 Finish neck and sleves by crocheting 1 in (2.5 cm) blue bands with sc (single crochet). To make the corners of the neck band mitered decrease for 1 sc in every row. 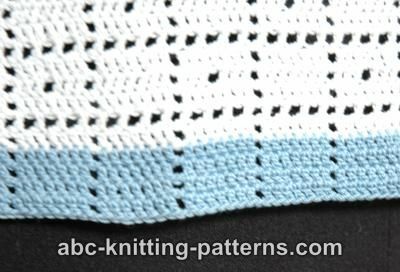 For the bottom band crochet 4 rows of *7 dc, 1 ch, skip 1* with blue yarn. Tie off. 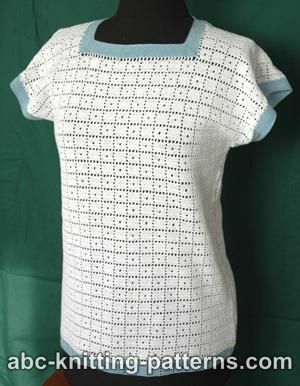 If it is a rectangle how to do create the sleeves? The size is 12/14, this info is as the top of the pattern. The top is made as a large rectangle with the hole for the head. 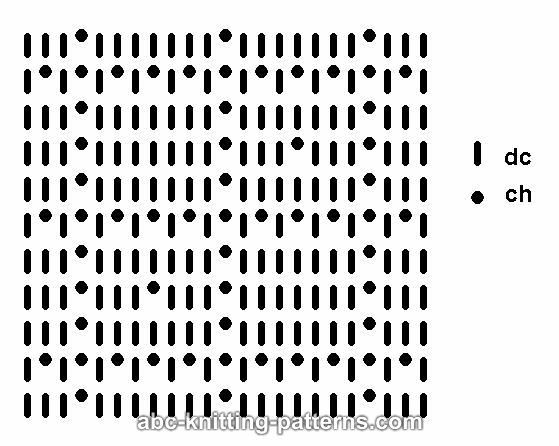 I like this pattern very much, but have 2 questions.1st there does not seems to be size indications. 2nd- I do not see directions for making the sleeve caps. Pattern indicates that you just go straight up to neck. Please clarify this for me. 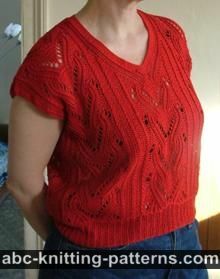 The sleeves are part of the body and are "self-forming". Would anyone know if there are skips between the ch1 in the repeated patterns? From the chart it looks like there are, but in the written instructions it doesn't say. Any help here would be appreciated! Thank you! So Cute! But why only size 12/14? Really would like to see 8/10. Guest I will have to chart it to see if I can figure how much to decrease.